Coach Cottage (sleeping 6 + cots) is in a secluded position in the centre of Southrepps, 5 mins walking distance from the child / dog friendly Vernon Arms pub which serves cask ale and great food. Built in 2014 this sunny, single storey, non-smoking cottage benefits from all modern amenities (e.g. underfloor heating, wifi, catch-up TV, wood burning stove) whilst offering a character cottage with Norfolk charm. Our guests say our well equipped Coach Cottage suits every age - new born to 90 year old grand parent as well as part time wheel chair users. Dogs seem to enjoy staying too. The cottage has a spacious, triple aspect lounge with double sided wood burner and French doors to garden. The ample seating includes an electric riser / recliner massage armchair. There is a separate south facing dining area and a modern, fitted and well equipped Shaker style kitchen. Sleeping 6 in 3 double bedrooms - you chose the sleeping configuration of bedroom 2 - twin, double or single if floor space is your requirement. Bedroom 1 has a shower / WC ensuite. All beds have pocket sprung mattresses, white cotton linen, and anti allergy pillows and duvets. Main bathroom with full length corner bath and separate shower cubicle. Separate (third) WC. Towels for 6 people included. 2 travel cots and optional child equipment. Good accessibility. Step free access, wide corridors and internal doors. Mobility aids available. Summer is a glorious time to stay - magnificent countryside to explore in an area with lots of sun and low average rainfall. The heavenly sandy beach of Mundesley (voted in 2016 as second best Blue Flag beach in the UK) is 10 minutes drive away. The beautiful countryside offers coastal and rural paths, many historic houses and mesmerising gardens. Throughout the year there are attractions, festivals and events aplenty. Winter is a wonderful time to visit North Norfolk too with plenty of concerts, Christmas markets, pageants, Boxing Day dips, New Year fireworks and Christmas / February pantos. Under-floor heating driven and a wood burning stove ensure you are warm and cosy. Coach Cottage is close to regional cycle routes and Norfolk Trails for walkers; near fishing lakes and golf courses, whilst surfers may ride the local beach waves. Private garden with garden furniture, BBQ. Table football in garage for 2-4 players. Off-road parking for 2 cars. Additional communal parking 50m away or on public road. Secure storage for bicycle / buggy / golfing & fishing equipment available in garage. For more photos and information on Accessibility (furniture & step heights / widths, mobility and child equipment available etc.) please refer to the Access Statement on the Accommodation page of Coach Cottage, Southrepps web site. Whilst the cottage is assessed under the National Accessibility Scheme as suitable for Part Time Wheel chair users, please note that the shape and style of the bath means it is not accessible for wheelchair users as there is no grab rail and a bath board may not be fitted. Also there is a pedestal at the wash basin; some guest use the perch stool for a more upright position. More information may be found in the Access Statement on our web site. When I visited North Norfolk on a cycling holiday over 12 years ago, I fell in love with Southrepps, the rural location, the magnificent church & wonderful pub. So I am delighted to be able to share the magic of Southrepps by offering Coach Cottage as a holiday let. My aim is that you have a lovely stay in Coach Cottage and that it may be enjoyed by every age and every ability. For that reason, I sought out a single storey, modern cottage at the centre of Southrepps village and provide optional baby / toddler equipment, mobility aids and a table football. If you have a special request please ask. Life in North Norfolk is easier with a car. If you don't have a car, the 33 bus service links Southrepps with Cromer and North Walsham and their train services. Gunton station is a 1.5 miles away. Perfectly situated to take advantage of all the attractions to the West and those, lesser known, to the East; Southrepps makes the ideal base. The wealth of activities and beautiful scenary offer something for everyone - beach life, bird & seal watching, cycling, golfing and just pottering around. One of the joys of living in North Norfolk is the many footpaths, nature trails and child / dog friendly pubs. So, families and well behaved dogs are most welcome at Coach Cottage. In early August, Southrepps hosts a week of classical musical concerts attracting top names. In December, Santa and his sleigh tour the village. Similarly the local villages host classical, theatrical and artistic events throughout the year so there is always a local activity to enjoy or, only 40 minutes drive away, the vibrant, cultural city of Norwich awaits. En-suite shower / loo to bedroom 1. Main bathroom with full length corner bath and hand shower, separate shower cubicle, WC and basin. Optional mobility/bathing aids available. Baby bath, toddler loo seat, potty available. Separate (3rd) WC with basin. Wheel chair users should note that the shape and style of the bath means there is no grab rail and a bath board may not be fitted. Also there is a pedestal at the wash basin - guests often use the perch stool. More information may be found in the Access Statement on our web site. 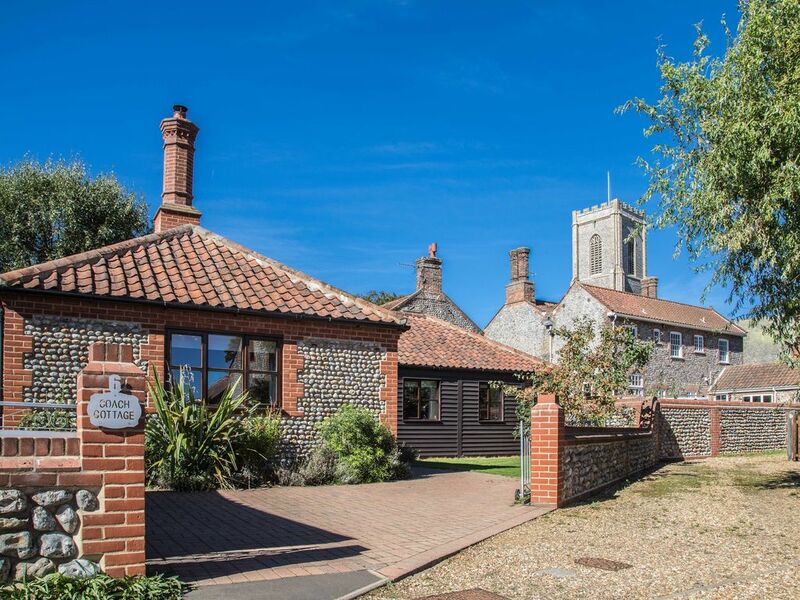 Coach Cottage is located at the very heart of Southrepps in dog friendly North Norfolk. A small village with a population of 800 it is surrounded by farm land and country walks. 10 mins drive to sea. The towns of Cromer with its magnificent pier and North Walsham are 6 miles away. The charming towns of Aylsham and Holt are 10 and 15 miles away. Southrepps is a rural village, 10 miles from the coast in an area of outstanding natural beauty. It has a magnificent church, post office, village shop and very popular pub serving great food. Underfloor heating with thermostatic control and wood burning stove. Anti allergy duvet and pillows. 100% cotton bed linen. Small tumble dryer in garage. Clothes airer and washing line. Parking available for 2 cars on the forecourt. One car may be parked in the communal area, 100m from the cottage, if space. Garage only available for storage of bicycles, mobility buggies or golf / fishing equipment etc. Not available to park car. Contains tumble dryer and table football. Wifi available in all parts of the cottage. Bath, Hand and Flannel provided. Kitchen towel and T towel too. Single oven with internal grill. Our guests say the kitchen is very well equipped. Modern shaker style kitchen. Our guests describe the kitchen as well equipped. Cookery books available and equipment for baking, eating in or take aways. Height raisers are available to either raise the height of the dining table to accommodate a wheelchair or to raise a dining chair. A selection of holiday reading is available including large print books and childrens books. Jigsaws, board and card games are available. Secure, walled and gated garden laid to lawn and flower beds. Patio area with table, chairs etc. Canoes may be hired from shops / outlets on the Norfolk Broads, down the River Bure and to explore the Dilham and North Walsham canal. The Norfolk Broads is an area where day boat and picnic boats may be hired. Mississippi Steam Boats offer tours. Boat trips near by to see the seals at Blakeney point. Body surfing is popular on many beaches from Sea Palling, Mundesley to Cromer. There is also wind surfing on Hickling Broad. Golfers can tee off in Mundesley golf course (4 miles) with its countryside views or at the 18 hole Royal Cromer Golf Course located by the side of the sea (5 miles), or Sheringham Golf Club (11 miles). Other courses are at West Runton (8 miles), Sprowston (20 miles) and Brancaster (36 miles). The Mundesley driving range is very popular with children and teenagers. Rated suitable for Older and Less Mobile Guests and Part Time Wheelchair users under the National Accessible Scheme. Our aim is that you may come and stay without having to pack mobility equipment. Optional mobility equipment includes shower / perch stools, toilet surrounds & raised seats, indoor and outdoor trolley, bed grab rail, chair / table raisers, wheelchair, adapted cutlery, FloTech pressure cushion etc. Ramp to back door. Wide doors & hall. Electric riser/recliner massage armchair in lounge; grab rails in bathroom, WC and at entry doors; 20cm step into shower. Some deficiencies for part time wheel chair users e.g. the shape and style of the bath means it is not accessible for wheelchair users as there is no grab rail and a bath board may not be fitted. Also there is a pedestal at the wash basin - guests often use perch stool at basin. For more info please ask for our Access Statement or contact the owner. A very well equiped and appointed cottage. Coach Cottage is one of best equipped rentals we have visited in the UK. The details provided by the owner, Kathryn, are well put together and a very accurate reflection of the cottage. Although we are not disabled, it appears that the cottage is well set up for the disabled visitor. The Southrepps location is within an hours travelling time of many great places to visit - marvellous sandy beaches, lots of nature reserves and historic houses with parklands/gardens. The area on the whole is very dog friendly within the normal workarounds. Most places to eat accept dogs from gastro pubs to beach cafes. Notables - The Gunton Arms at Thorpe Market is well worth booking for either lunch, dinner or both ! We loved the sandy beaches and nature reserves of Brancaster Beach, the Holkham Estate and Salthouse. Thank you very much for such a delightful review of your stay at Coach Cottage. Am delighted you enjoyed it. Being 10 minutes drive from the coast and with so many activities and attractions in the near vicinity of Southrepps there is so much to explore. So should you venture this way again to further investigate what North Norfolk has to offer, I do hope you will consider returning to Coach Cottage. What a superb cottage I don’t think we’ve stayed anywhere with a more comprehensive set of equipment and on top of that more mobility aids than we have at home! It’s a very cosy and comfortable cottage situated in a small village with easy access to the sea and attractions of the north Norfolk coast. We can’t recommend it more highly and now we’ve found it we’ll be returning as soon as possible. Thank you so very much for taking the trouble to write such a charming review following your stay. Am utterly delighted by it. So glad you found Southrepps well located and that our optional lifestyle aids were useful to you - we do find some guests discover equipment they never knew existed, there being so much on offer these days, and purchase when back home! Being able to remove it too adds flexibility so we can meet individual needs. Be delighted if you returned. Thank you again for choosing Coach Cottage. Super cottage, could not ask for any better. Very well equipped and in a great location only a few miles from the coast. Kathryn's advice re shops and places to go really appreciated. Nothing negative to say about the cottage or location and would definitely like to return. Thank you very much for taking trouble to post such a generous New Year stay review. Since your stay we have been rated 4 star gold with 100% cleanliness for the 4th year in a row by VisitEngland. Be delighted if you returned. Come in spring or summer and see what other adventures dog friendly North Norfolk offers. Once again, thank you. Thank you for taking the trouble to post such a positive review of your December stay at Coach Cottage, We are so very lucky to have a wonderful pub in the village just minutes walk from the doorstep and to be located virtually mid way between the magnificent seals (and pups) at Horsey and the larger colony at Blakeney. Should you return to North Norfolk to continue your adventures, I do hope that you consider returning to Coach Cottage. Wishing you a Merry Christmas and Happy New Year. We feel incredibly lucky to have stumbled across Coach Cottage. The owner provided so many special and thoughtful touches which just added to the magical atmosphere. We simply adored chilling out in the cottage but also highly recommend a trip to Cromer and Horsey (to meet the seals). A meal in the local Vernon Arms pub is also a must. Coach cottage is a gem of a find and we can't wait to return. Thank you for everything. Stunning cottage which was decorated beautifully for the season. All we needed and more was there. Very clean, excellent facilities and very well maintained. The owner was a delight. always in contact, provided excellent guides of things to do and places to go. We do hope to go again and explore the area further. very enjoyable meal at the local pub and Santa was around with his elves which added to the weekend totally. We visited Cromer and the seals at Horsey but mostly enjoyed the peace and tranquillity of this delightful cottage. Would totally recommend to friends and family. Thankyou for a wonderful stay. Thank you for posting such a charming review of your stay at Coach Cottage. Am delighted you enjoyed your stay and that it coincided with the circumnavigation of Southrepps by Santa in his sleigh. It is quite a unique experience I think. There us so much to see, do and explore in North Norfolk I hope that you return for a longer break and, if so, that you consider returning to Coach Cottage. Wishing you a very Merry Christmas and a Happy New Year. Norfolk has many sandy beaches, nearby Mundesley-on-sea (4 miles) is the undiscovered gem. Teenagers often body surf. Good line fishing. The charming town of Cromer(5.5 miles), renowned for Cromer Crab, boasts a thriving pier with the only end of pier theatre in England. Midway between famous Holkham beach & seals at Horsey beach. Mundesley, Cromer and Sheringham all have life guards in high season and year round life boat / in-shore rescue. Dogs allowed on beaches but in restricted areas. London Stansted airport is 105 miles away. Public transport from Stansted is possible but not easy; car hire recommended. Having a car in North Norfolk makes life easier, however public transport serves the village - a bus service stops at the pub (5 mins walk away) and Gunton train station is 1.5 miles away. North Walsham and Cromer are nearest larger rail stations where taxis may be found. If you plan to come by public transport, do contact the owner for advice. The cottage is 5 minutes walk to the local pub serving food and cask ale, with a further few minutes walk to the PO, corner shop and village's children's play area. The nearby local villages of Northrepps (2 miles), Trunch (3 miles), Mundesley (4 miles) and Overstrand (4 miles) and towns of Cromer (5.5 miles) and Sheringham (11 miles) host classical, theatrical and artistic events throughout the year so there is always a local activity to enjoy. Norwich is about 22 miles away. Southrepps Classical Music Festival, Beer Festival and the many events in the magnificent church including climbing its tower. Children may enjoy the village play area with zip wire and football pitch. Mundesley's (4 miles) idyllic sandy beaches (dogs permitted in all but central section) and Cromer's (5.5 miles) unique pier & Amazona Zoo. Margaret's Amazing Doll Hospital & Museum in Bacton (6 miles) - bring your broken teddy, doll or toy on holiday and return refreshed & mended! Happisburgh (10 miles) famed for its independent lighthouse & disappearing shoreline. Sheringham's (11 miles) steam train to Holt. The magnificent Elizabethan Great Barn at Waxham (19 miles). Sea Palling (20 miles) popular for wind surfing. Horsey Beach (22 miles) for walking the dunes and seal watching especially in winter. Or off Blakeney (19 miles) - by boat. Sometimes seals, and even whales, are seen at Mundesley. National Trust lovers will enjoy visiting the nearby Horsey Wind Pump, Felbrigg Hall, Blicking Hall with Anne Boleyn’s ghost and Sheringham Park. For those who want to travel further back in time, budding geologists will enjoy fossil hunting on the beaches. Guided fossil tours are available. For garden lovers, then an absolute must is East Ruston Vicarage Gardens (11 miles). Cyclists will enjoy the quiet lanes, walkers the many Norfolk Trails and Coastal Path, then there is bird and seal watching. Anglers may try their skill in the local ponds or sea fishing. Waitrose, Morrisons, Lidl, Sainbury's, Tesco supermarkets are nearby & deliver. Booking Notes: Please ring the owner (01263 722381 / 07710 046869) or send an email to confirm availability or for any booking queries. The booking is only valid once the deposit of 33% has been authorised by bank. Full payment is due 8 weeks before start of hire period. There is an extra £10 charge per stay for one or two dogs. £100 security deposit payable on the day of arrival. There is a £100 returnable breakage deposit due on arrival. Full Ts & Cs are on the Coach Cottage web site (www.coachcottagenorfolk.co.uk) - see link bottom right of page or please contact the owner for a copy. Changeover Day: Friday is our normal changeover day excepting short breaks and Christmas / New Year. Access from 4pm (though may be earlier with prior arrangement). Departure by 10am. Notes on prices: Short breaks may be possible upon request. Please contact the owner.